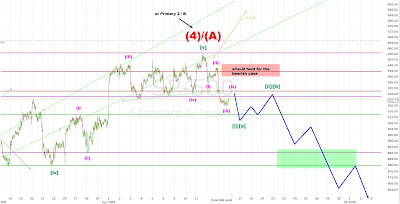 Technical Analysis and Elliott Wave Theory: Was 956 the top of the rally? It seems so! A nice day for the bears! The market broke the support lines around 926. Thus the orange count is invalid. There are now two possibilities: Either the top was Intermediate (A) of Primary B or it was Intermediate (4) of Primary 1/A. In the first case the market should correct about 50% of the entire rally from 667 to 956. In the second case the market should make slightly lower lows (~640) in the summer.